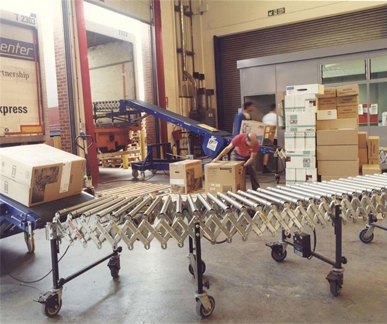 Optimum Telescopic Belt Conveyors, also known as cantilevered booms or extendable conveyors, will load/unload virtually any loose item quickly, safely and efficiently. By extending directly into the trailer without the need of support Optimum Handling Solutions will significantly reduce load/unload times. 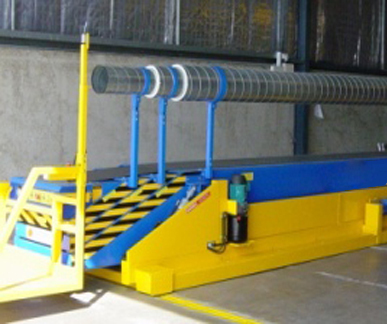 The Optimum Telescopic Belt Conveyor is a modern and robust conveyor designed to provide superior service and reliability. Can be safely operated by just one person. Front of boom is always at the loading / unloading face reducing physical effort, lifting, carrying and back strain. 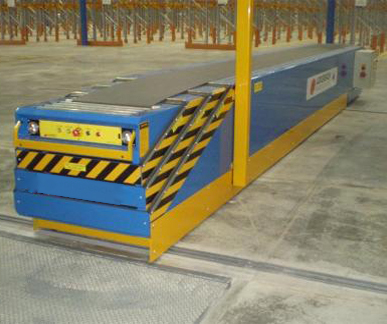 30 metres / minute belt speed provide rapid load / unload capability. Two heavy duty halogen lights provide illumination directly into the loading area. All rolling components have lifetime lubricated sealed bearings and crowned belt rollers ensuring accurate belt tracking. 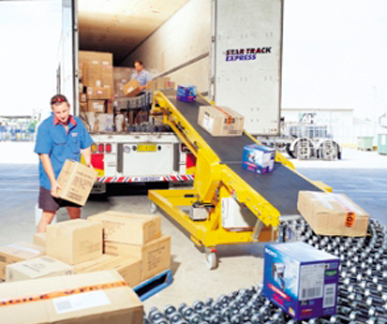 The unique Optimum Dockless Trailer Loader delivers outstanding carton-loading performance and value in small - medium warehouses without loading docks. Optimum Dockless Trailer Loader are designed specifically for use in premises without a raised loading dock, which makes it ideal for loading vans and other smaller vehicles. Using this unit makes your vehicle loading/unloading operation faster, safer and more efficient, and helps you comply with manual handling regulations. Construction – Heavy duty construction and supporting frame work make Dockless Trailer Loaders one of the most robust units of its type on the market. Shrouded Buttons – To limit the damage to emergency stops, Best conveyors add fabricated steel shrouds to the exposed emergency stop buttons. Mobile – Units are fully mobile utilising ø200mm heavy duty castors. Power – Normally powered via a simple 240Vac plug connection. 110Vac and 415Vac versions are available. Each unit comes with ancillary sockets to power adjoining flexible conveyors.